Journalists whine that bloggers make something out of nothing, but that was my reaction after reading today's Michael O'Keeffe and Bill Madden piece for the New York Daily News saying that the Yankees could be up for sale soon. Maybe I'm old-fashioned, but I think that sportswriters ought to have something more than hearsay and rumors and anonymous quotes before writing such an explosive story. “There has been chatter all around the banking and financial industries in the city for a couple of weeks now,” one high-level baseball source told The News. This is worthy of front-page and back-page covers in the New York Daily News? Because some anonymous Wall Street workers and baseball names are speculating about how much the Yankees could be worth, because the Dodgers were sold for so much? Spare me. Look, it is always possible that the Steinbrenners could sell the team one day, or even sell it in the near future. But where is any evidence that this is going to happen? O'Keeffe and Madden do not have a single hard fact or on-the-record source showing that this could happen, yet they have written a news story, not an opinion column, saying that the Yanks could be for sale soon. 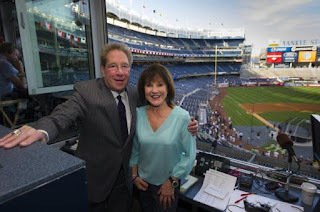 There is only one named source in the article, Yankees president Randy Levine, who gave a flat denial to the News saying: "The Steinbrenners are not selling the team. Heck, there's not even an anonymous source saying that they will sell the team; just that they could sell the team. Full disclosure -- as long-time readers know, I used to work at the News, but my opinion would be exactly the same on this article whether I had worked there or not. O'Keeffe and Madden not only make a whole lot out of supposition and rumors, they insinuate that Hal Steinbrenner may want to sell the team because he said this spring that he was a "finance geek" and that a good team didn't need a $220 million payroll in order to win. Then the article misrepresents Hal's position on the A-Rod re-signing in 2007, blaming Hank Steinbrenner for it. They continue, "Hal Steinbrenner rarely attends games, and according to those who know him, abhors doling out the huge money long-term contracts such as the Rodriguez deal." Really? Then why did Hal sign off on that deal, as well as the CC Sabathia (seven years, and then an additional two years) and Mark Teixeira (eight years) contracts? Not to mention paying A.J. Burnett $82 million, and then paying nearly 2/3 of Burnett's last two years on the contract for him to pitch for the Pittsburgh Pirates? Buster Olney wrote the definitive version of what happened in the A-Rod contract -- I talked about it in Subway Squawkers last year. The gist of it is that Randy Levine, not bogeyman Hank Steinbrenner, did most of the negotiations with A-Rod and his people. And A-Rod had to go to Hal's house and apologize in person for the opting-out shenanigans before he would sign off on the contract, which he did. Contrary to this story, there is no evidence that Hal opposed the A-Rod deal, just that he was ticked off over the opting-out stuff. Let's review. By buying the Yankees in 1973, George Steinbrenner was able to take an under $10 million investment and build a team worth several billion. Tell me in what other legal business you can get that sort of rate of return. Sounds pretty "smart" to me. Again, Hal signed off on all of the modern big-spending Yankee deals. He also agreed to bring back Brian Cashman, the GM who has one tool in the toolbox -- the ability to spend money. Sure, Hal has made it clear he wants the payroll to go down, but that doesn't mean 1) that he doesn't bear his own share of responsibility for the Yankee payroll and 2) that he is going to sell the team anytime soon. Besides, there are four Steinbrenner children who would have to sign off on the sale. So there you have it. Michael O'Keeffe and Bill Madden have declared that the Yankees could be for sale soon, with the "evidence" for this based solely on rumors, speculation, and twisting around of the facts. I am eagerly waiting for the News' next report, about how Ferris Bueller passed out at 31 Flavors. Lisa will be squawking baseball with Mike Lindsley of Syracuse's The Score 1260 at 12:30 p.m. today. If you are in the Syracuse area, you can listen to her on 1260 AM on the radio. If not, check out the station's web site and listen to her there. Thanks! Oh no! Mets have a better record than the Yankees! Yeah, yeah, I know that it is still early. But the fact is that on May 18, 2012, with nearly a quarter of the season played, the New York Mets have a better record than the New York Yankees, despite the over $100 million payroll differential between the two. The Mets are 21-17, and the Yanks are 20-18. Yankee fans are used to saying "See you in October" when it comes to slow starts. After all, they have had several very sluggish starts in recent years, and still made the playoffs. But to me, so far this season seems to have more of a 2008 feel (when they didn't make the postseason at all) than a 2006 feel. You cannot go 3 for 41 with runners in scoring position in your last five games and expect to win. And really, I've had it with seeing Joe Girardi not bench Mark Teixeira to get some rest. I once ended up in an emergency room due to a bad case of bronchitis -- I could not breathe. So I know how debilitating a bronchial infection can be. Meanwhile, Tex has a bad bronchial infection, yet he keeps on playing, despite not exactly doing the team much good by doing so. Teixeira keeps on saying how he's going to grind through this, which is silly. Take some time off, or, more to the point, Girardi ought to make him take some time off, and maybe Teixeira might actually get better at some point. Put it this way -- if you cannot get through a day or a game without at least one coughing fit, it's time to take a day or two off, for goodness sake. Now there's talk that Tex might finally get a day off -- about a week or so too late. So yeah, I am a little cranky this morning, especially knowing that the Mets have a better record than the Yanks. And that is with me jinxing the Mets with my appearance twice this year! Squawker Jon and I were at Tuesday's Met loss. Believe it or not, we sat in front of a row of eight nuns, and they still couldn't outdo my jinxing powers! Before the Squawkers attended last night's return of Jesus Montero to Yankee Stadium, Lisa predicted that the former Yankee would hit a home run. And he did! Since Lisa has managed to jinx most Met games she has attended, I was hoping to return the favor, and it looked like it might happen when Montero's homer put the Mariners ahead in the sixth inning. But it was not to be. Last night, the Mets blew a ninth-inning lead and their five-game winning streak came to an end. The only other notable win streak the Mets have had this year (four games) came to an end when Lisa and I went to the April 10 loss to the Nationals. Maybe I should just stay out of all ballparks with Lisa when the Mets go on a winning streak. The apologists for the disastrous Montero-Michael Pineda trade can take heart in the fact that Montero's 1-for-4 evening dropped his Yankee Stadium batting average from .500 (15-for-30) to .471. His OPS in Yankee Stadium plummeted from 1.483 to 1.462. Meanwhile, current Yankee catcher Russell Martin isn't enjoying the cozy confines of Yankee Stadium quite as much this season. Martin is hitting just .071 (3-for-42) at the Stadium with an OPS of only .347. While at Yankee Stadium, I got the meatball sandwich from Parm in the Great Hall. Along with the Lobel's steak sandwich, Yankee Stadium now has two concession stands with food worthy of the offerings at Citi Field. Squawker Lisa, in case you don't have access to the standings, I thought you should know that the Amazing Mets are 18-13 while the Yankees are 17-14. If the season ended today, the Mets would be in the playoffs thanks to the new system, while the fourth-place Yankees would be playing golf (maybe they could invite Josh Beckett). Despite the NL East being much improved this year while the Mets cut their payroll by $50 million, the Mets are 13-5 so far against their divisional rivals. They have already swept series from the Phillies, Marlins and Braves. In the just-completed sweep of the Phillies, the Mets had to face Roy Halladay and Cliff Lee, while both Johan Santana and R.A. Dickey missed the series. Tonight, however, I won't get to watch the Mets make their first visit to the new Miami stadium because the Squawkers will be heading up to the Bronx to see Jesus Montero's first game back in New York. Lisa was opposed to the Montero trade from the start, while I thought it was more evenhanded, though not without risk considering how poorly Michael Pineda did in the second half last year and how bad his record was pitching outside of Seattle. Montero has played 29 games for Seattle and been the catcher in 12 of them. Montero is now hitting .268 with 4 homers and 16 RBI. Current Yankee catcher Russell Martin is hitting .188 with 3 homers and 7 RBI. For those who think that a closer's importance is overrated, let me discuss something I usually bring up about as often as I offer tributes to Yankees - the 2000 World Series. The Mets led Game 1, 3-2, going into the ninth. If they won the first game it could have changed the tone of the whole series. The Yankees were two-time defending world champions. They had swept the last two World Series and had won 12 straight World Series games going back to 1996. The Mets, though, had won 94 games that year to the Yankees 87. A Game 1 victory by the Mets at Yankee Stadium would have had a lot of people believing that the Mets could win. But the Mets had Armando Benitez as their closer. They didn't have Mariano Rivera. Instead of an important win establishing the Mets as a serious challenger to the Yankees' title, the difference in closers resulted in a devastating loss that might have sealed the Mets' fate right there. Imagine if the events of Game 2, where roid-raged Roger Clemens threw a bat shard at Mike Piazza and Mariano gave up a three-run homer to Jay Payton in the ninth as the Mets rallied for five runs, only to lose, 6-5, had left the series tied, 1-1, heading to Shea, instead of giving the Yankees a 2-0 lead. Mariano's reputation was already such that the fact that the Mets rallied against him would have added to the sense that the Mets could win the series. (Mariano would never allow another homer in the postseason. In 141 postseason innings, the only other homer he's given up was to Sandy Alomar Jr. in 1997.) But because of Benitez' blown save, the Mets knew they still had to win four of five from a team that had Mariano at the end of the game. In Game 4, it was the Yankees' turn to lead, 3-2, going into the ninth. Only the Yankees didn't have Benitez, they had Mariano, who had already pitched a scoreless eighth. In the ninth, Mariano pitched a 1-2-3 inning with two strikeouts. The Yankees now led the Series, 3 games to 1. Game 5 was tied, 2-2, going into the ninth. Al Leiter gave up two runs in the ninth and left the game after throwing 142 pitches. Manager Bobby Valentine might well have taken Leiter out earlier - if he'd had Mariano in his bullpen. With the Yankees now ahead, Mariano pitched a scoreless bottom of the ninth, picked up his second straight save, and the Yankees won the World Series. Some of you are probably thinking, so what if Mariano is no Benitez? The 2000 Mets also would have had a better chance if their shortstop had been Derek Jeter instead of Mike Bordick. For his career, Benitez had 289 saves with a 3.13 ERA and 1.22 WHIP. But in 30 1/3 postseason innings, Benitez had a 3.56 ERA and a 1.45 WHIP. Mariano, as everyone knows, has spectacular career numbers: 608 saves, 2.21 ERA, 0.998 WHIP. But his postseason numbers look like typos: 0.70 ERA; 0.76 WHIP in 141 innings with, appropriately enough, 42 saves. So for those who think a closer's value is overrated, think of what it means when a pitcher with those sorts of numbers is waiting for you at the end of a postseason game. Three years ago, Squawker Lisa and I saw Mariano get his 500th save in a Subway Series game at Citi Field. It was also the game where Mariano got his first career RBI when Francisco Rodriguez walked him with the bases loaded. Coming only a couple of weeks after the Luis Castillo game, I was pretty fed up, especially when the Mets later sent Mariano the pitching rubber from the game. But now I'm just sad at the likely end of a great Yankee's career that even I can admire. This is one of the saddest posts I have written for our Subway Squawkers blog since we started writing the blog in 2006. Mariano Rivera's career may be over, thanks to a torn ACL and a torn meniscus. Geez, it's painful even to write that. I'm still in shock over what happened. I was out for a walk last night, talking on the phone with one of my brothers, when Squawker Jon kept on trying to call me. After a few times, I finally picked up. Jon then said he wouldn't keep on calling me if it weren't important, and told me that Mariano Rivera was carted off the field after shagging flies. Yikes, talk about a punch in the stomach. Although Jon did say that Mo was smiling on the cart while leaving the field, as soon as I saw the clip when I got home, I figured his initial reaction indicated a torn ACL, and unfortunately, that suspicion turned out to be correct. What a nightmare. I was very tired last night, and went to bed before the game was over, so I didn't get to hear the official diagnosis. But Squawker Jon did stay up and watch the postgame, and he sent me an email about it last night, saying that "Just saw Mariano interviewed and he was teary. Even I'm upset." I also heard from some other Met fan friends, sending prayers and positive thoughts Mariano's way. Needless to say, Mo's absence will be felt with the Yankees. He is the greatest closer of all time, and the Yankees would never have won four rings in five years without him. He is also a great human being, too. I got to meet him a few years ago, and was very impressed with him as a person. Some in the media are trying to insinuate that him getting hurt while shagging balls was a preventable injury. Nonsense. We're not talking about him jumping on a trampoline; Mo was doing something baseball-related. This is why I have so little patience for those who get injured off the field being reckless; there is enough that can happen within baseball to hurt a career, without going out looking for things! There will be enough time in a later blog entry to speculate about who will ultimately replace Mo. Today isn't the time for it. I'm still heartbroken over the loss of Mariano Rivera. The Mets went into the season with no starting pitching depth. After Chris Schwinden's latest outing, the Mets' inability to spend any money on rotation depth has come back to haunt them. Schwinden has now given up five earned runs with two homers in four innings in both of his starts. His ERA is 11.25. Even if you give him a pass for his first start being at Coors, you want to see a lot more against the Astros. But Schwinden is only in there by default. If he gets pulled from the rotation, the other candidates appear to be Jeremy Hefner, claimed by the Mets after being waived by the lowly Pirates, and 41-year-od Miguel Batista, who has already bombed in a spot start this year, giving up six earned runs in 3 2/3 innings against the Giants. The Mets got an unlucky break when Mike Pelfrey went down for the season, but it's not as if they could expect that the entire rotation could stay healthy all year. Not when Johan Santana is returning from a serious injury, R.A. Dickey is 37 years old and Jon Niese has been on the disabled list each of the last three seasons. Ironically, Pelfrey was the pitcher who never got hurt - until now. Technically, the Mets do have a backup plan for the rotation - Chris Young, who is recovering from his own serious injury. Young went down for the year after just four starts last season. His last full season was in 2007. Young is rehabbing in the minors, but wouldn't you know it, he just suffered a setback. At least there's no talk so far of rushing Matt Harvey or any of the other pitching prospects to the majors to fill the hole in the rotation. Let's hope that doesn't change. Not having rotation depth could be writing off this season - no need to risk the future as well. When I heard today about how Andy Pettitte indicated that he might have, um, misremembered what Roger Clemens said about HGH, my first thought was that it was something out of a movie. The Godfather, Part II, that is! The FBI guys promised me a deal. So I made up a lot of stuff about Michael Corleone. Because then, that's what they wanted. But it was all lies. Everything. They said Michael Corleone did this, Michael Corleone did that. So I said, "Yeah, sure." “As you sit here today, you believe in your heart and mind that you very well might have misunderstood Mr. Clemens in 1999 or 2000?” asked one of Clemens’s defense lawyers, Michael Attanasio. “Could have,” Pettitte said. “It’s 50-50 that you might have heard it, might have misunderstood it?” “That’s fair,” Pettitte replied. The thing of it is, being so ambiguous, and unsure, will not change anybody's minds who thinks that Pettitte was a rat. It will not repair his friendship with The Rocket. But what it could do is give a jury reasonable doubt on finding Clemens guilty. Lovely. Thanks for nothing, Andy! And Cashman was like Kim Kardashian in trying his best to make a spectacle of himself to get publicity. He's been GM since 1998, yet it took him until 2012, after he was finally on the hot seat a little bit, for him to go hang out with the proles in the bleachers? Spare me. It is about as shameless a publicity ploy as Kardashian's faux-mance with Kanye West, where they have hit up nearly every high-trafficked tourist spot in New York to show off their "love." How perfectly fake. Come to think of it, maybe we're going to see Kanye and Kim in the bleachers soon, too. Good grief. When the best you can say about Phil Hughes' pitching is that he didn't stink as much as he has in his previous four starts, it is not a good night. Especially when he didn't even pitch as well as Hector Noesi (traded as part of the Jesus Montero/Michael Pineda deal) did last night for the Seattle Mariners. Speaking of Montero, he went 4-for-4 last night for Seattle, and hit a home run the night before. His batting average is now up to .294 (better than every Yankee starter except for Derek Jeter) and he has hit 4 homers (as many as Jeter and A-Rod) and driven in 13 runs (which would put him at third on the Yankees). Not that the Yankees could use him or anything, especially with Nick Swisher out of the lineup. Meanwhile, rumor has it that Pineda caught up on his reading, finishing "The Hunger Games" just in time so he could catch the movie in the theaters. Next up, to steal a joke from my friend Sully Baseball, a thrilling game of Sudoku. Good times!